I thought my logo would make a good test attempt, as it’s made up of some simple shapes/lines. I scaled it to size in a vector drawing program, printed it out in black on paper, cut it out and spray mounted this mask onto a newly cleaned piece of brass (the flap from an old letterbox, about 3mm thick). I then painted over the mask with some enamel paint and, when dry, carefully removed it with a scalpel. The process went quite well, and left a very clean and surprisingly deep etch. Unfortunately I think the etchant started to seep through/under the enamel paint, so the previously smooth and shiny brass surface has been left pretty pitted. Overall though, a useful exercise and I’m now ready to try the real project. Just need to work out how to prepare a new (much more complex) mask, and also source some new brass… Will post the results when completed. Ron is a fellow musician/mandolin player, so I’m even more pleased he seemed to like the recording. I’ve just spent the weekend at the Spratton Folk Festival, playing bass with Navaro who are working hard to promote their soon to be released album, Under Diamond Skies. The festival was very well organised, with some great names playing over the course of the weekend – the weather was atrocious unfortunately so that probably impacted on numbers somewhat, but the enthusiasm seemed un-dimmed. Christmas comes early for the Welding Man! I’ve just been given the most fantastic present to aid me in my welding investigations! 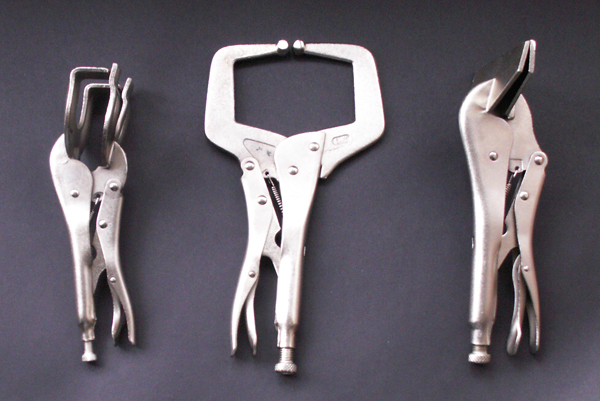 A set of handy tools (basically mole grips with different shaped ends/jaws) specifically designed to hold bits of metal together when welding them…. Gone are the days therefore of having to try to hold my work down by putting heavy things on top of them, nailing them in place to the top of workbench or rashly holding them in trembling gloved hands!!! A moment of Ceilidh madness. . .
Rather rashly last week, I somehow seem to have taken on yet another short-notice dep gig… My local ceilidh band (containing a load of friends of mine I’ve wanted to play with for ages) has temporarily lost their mandolin player through ill health. Although everyone hopes he’ll be up and about again as soon as is humanly possible (all the best Andy if you are reading this…) they urgently need a dep for a couple of gigs in a fortnight. Unfortunately I’ve no idea how to play any of the tunes, which are all fiendishly fast and, on first listening at least, sound pretty much the same (but aren’t of course!!). The learning process isn’t helped of course by my total inability to read music – the band has kindly presented me with a folio of hand written dots, but they may as well be in Martian for all the help they are to me! What I do have however is a cd of live material ­containing about 15 tunes (or ‘sets’) in all. As is the wont with folk dance music however, each set is made up of 3 different tunes – so that leaves me approximately 45 tunes to learn in less than a fortnight… Did I mention that the gig is also on the mandolin which isn’t exactly my first instrument!? So, with headphones at the ready, I’ve ‘set to’! One thing that’s really helping are some sheets I drafted up ages ago of fretboard diagrams. I’ve always found them invaluable for jotting down all sort of notes, patterns, bits of tab etc, etc. So, I thought I’d post them up as downloadable PDFs in case anyone else needs them – I’ve got a version for both guitar, bass and mandolin so simply click on the links after the image below to download them (about 700Kb each).